KANNUR: Kerala has lost huge expanses of paddy fields in the past few decades and we have just around 2.75 lakh hectares of paddy field left in the state compared to over nine lakh hectares thirty years back thus resulting in major reduction in paddy production, according to experts. "Though we require over 40 lakh tonnes of rice per year today, our production is just six lakh tonnes and we have to depend on other states for our needs," said A S Anilkumar, agronomy professor at College of Agriculture, Padannakkad, addressing a seminar organized by the Department of Agriculture in Kasargod collectorate on Thursday. Since the lost paddy fields cannot be reclaimed, then only way is to increase the productivity in the remaining paddy fields through mechanization and modern methods of cultivation, he said. Thought this the issue of labourer scarcity can also be effectively addressed. "As of now we produce only five tonnes of paddy per hectare, and this should be increased to at least 10 tonnes," he said pointing out that in the states like Karnataka and Andhra Pradesh the production is to the tune of 20 tonnes per hectare. Earlier, agriculture minister K P Mohanan distributed Rs one lakh each to ten Padasekhara Samithis in the district in a separate function in the same venue. Rajahmundry: As the irrigation canals and drains are scheduled to be closed on March 31 for taking up works as part of Godavari delta modernisation, farmers are advised to take up direct sowing of specific varieties of paddy seeds to enable them go for early harvest during rabi season in Godavari districts. Paddy is raised in about three lakh hectares land in both the districts during rabi and the agriculture authorities are advising the farmers to go for direct sowing of seeds unlike the conventional practice of raising nurseries and transplanting them in the fields. Direct sowing of seeds also helps the farmers save money by engaging farm labourers. After the launch of Mahatma Gandhi National Rural Employment Guarantee Scheme a few years ago, it has become a Herculean task to the farmers to engage the labourers as nobody is turning up for work as they find work and good wages under the scheme itself. Agriculture authorities say that it helps the farmers save labour costs to the extent of Rs 1,500 to Rs 2,000 per hectare. The authorities are suggesting to the farmers to use specific variety of seeds like 1001, 1010 and IR 64 if possible and other varieties as they help the crop to reach harvest stage in about 120 days and the direct sowing of seeds helps the farmers to save harvesting time by about a week. At present the farmers are having 90 days from January 1 to March 30 and as the canals will be closed for repair works the next day, the paddy crop has to depend upon residual moisture in the earth to get nutrition and grow further. Paucity of time for raising the crop is mainly applicable to the farmers located in central delta area as they harvested the crop at a delayed time following the cyclonic storm Helen. The farmers located in eastern delta have already started direct sowings much earlier and the exercise is expected to be completed in a day or two. In East Godavari, paddy is expected to be raised in about 1.52 lakh hectares area and out of the required sowings in about 7,500 hectares, the farmers have taken it up in nearly 6,500 hectares. A total of 1.28 lakh hectares of land have been covered under samba cultivation during the current season in the district. Direct sowing was done on 70,264 hectares of land. Of the 58,148 hectares covered under transplantation method, 23,842 hectares were covered under conventional method and SRI method of cultivation was adopted on 34,306 hectares, District Collector S. Natarajan said while addressing the farmers grievances day meeting here on Thursday. A total of 18,394 hectares of land had been brought under Kuruvai cultivation in the district during the current season — SRI method 12,176 hectares, direct sowing 274 hectares, and transplantation method 5,944 hectares. Thaladi transplantation has been completed on 18,358 hectares of land, — 8,693 hectares under conventional method and 9,665 hectares under SRI. The samba and thaladi crops are in an advanced matured stage. They are prone to some kind of disease. The Collector advised farmers to take up crop protection strategy by applying pesticides. The Collector said the district experienced a rainfall of 150.74 mm. so far in December, against a normal rainfall of 175.28 mm. Referring to the extension of financial assistance to farmers, Mr. Natarajan said the nationalised banks had targeted to extend crop loans to the tune of Rs. 1,81,138 lakh. Thanjavur District Central Cooperative Bank targeted to provide Rs. 6,500 lakhs worth crop loans, of which 5,062.10 lakh had been distributed to 17,755 farmers, Rs. 2,341 lakh as jewellery loans to 6,772 farmers. The Kumbakonam District Central Cooperative Bank targeted to extend Rs. 7,500 lakh as crop loan and had so far sanctioned Rs. 6,846.89 lakh to 20,762 farmers as crop loans, and Rs. 2,497.17 lakh as jewellery loan to 4,803 farmers. The government recently opened 62 direct procurement centres in the district in addition to 16 centres existing. During the kharif season, 2013-14, 16,928 tonnes of paddy had been procured by these centres. Paddy farmers of the district who failed to get expected yield during kharif season due to poor rainfall coupled with non-supply of water, are now pinning their hopes on rabi crop as the district recorded good amount of rain. However, the acreage of paddy cultivation has come down in rabi season as the farmers in upland areas were not sure of water to the fields. Paddy was cultivated in just 32,241 hectares in kharif as against 62,001 hectares normal cultivation area. Nearly 1.88 lakh metric tonnes of paddy was yielded from kharif operations, official figures said. In rabi season, which began in October, 11.68 metric tonnes of paddy was expected in 1,17,198 hectares against the normal acreage of 1,98,135 hectares. According to officials, nearly 13 paddy varieties like BPT 5204 (Nellore Zilakara), Samba Masuri, Subbaiah Buddalu, M3 1010, NLR 3041, NLR 34449, NLR33892, ER1009, ADT 37, ADT43, Sona masuri, Kurnool variety and others are grown in the district, most important of them being Samba Masuri which is being cultivated in 12,800 hectares in rabi. Agriculture joint director KV Subba Rao said that only 270 mm rainfall was recorded against 660 mm rainfall this year. However, with good inflows from upward areas, the reservoirs in the district have good inflows and officials are expecting good yields this season. There is 56.821 tmc of water against full capacity of 78 tmc water level in Somasila reservoir, 9.40 feet against 12 feet capacity in Sarvepalli reservoir, about 18.60 feet against 21.45 feet in Kanigiri reservoir and 16.20 feet against 16.30 feet water is available in the current rabi season. However, he said that there will be a setback to paddy cultivation under rainfed tanks and borewells in Udayagiri, Vinjamuru, Seetharamapuram, Msarripadu, Kondapuram, Duthaluru, Anumasamudrapupeta, Rapur and other areas because of drastic fall in groundwater levels. ‘’Despite recent heavy and incessant rains due to Helen, Leher, Phailin cyclones in the state, Nellore district did not get sufficient rains ,” he said. However, rice millers say paddy farmers have secured 13.65 lakh metric tones of paddy during kharif while the yield would be 15.50 lakh metric tonnes during rabi in the district. Meanwhile, wholesale rice traders, who saw good profits last year as they sold the Zilakara Masuri at Rs 48 per kg, Nellore Zilakara at Rs 38 per kg, may have to taste a bitter experience this year as they may have to face huge losses in the business with the prices of those varieties drastically coming down to Rs 38 and Rs 25 per kg due to high yield. ‘’If the situation continued this rabi it is better to wind up the business as it is highly impossible to survive in the rice trade as there is abnormal production in the district. The traders who expected good profits in the rice business stored lakh of tones in godowns and they may secure heavy losses this year,” Menta Hari Venkatesh, a wholesale rice trader said. Meanwhile, farmers can be assured of some good price to their produce with the administration ready to purchase 3.5 lakh tones of paddy during rabi for public distribution system under ‘Mana Biyyam Scheme’ in the district. Torrential rain and flooding in the last few days have destroyed paddy cultivation across more than 80,000 hectares in four districts of south Bengal. This year, there could be a shortfall of around 42 lakh tonnes. The damage has caused the state agriculture department to raise concerns about shortage of rice but hopes for a better situation when the kharif crop is harvested in the winter. Inundation in the four south Bengal districts of Howrah, Hooghly, East and West Midnapore, which destroyed paddy on huge tracts of land, could lead to a production loss of nearly 7 lakh tonnes of rice. According to agriculture department officers, this would affect the state’s target of 110 lakh tonnes for the monsoon season, which would have helped achieve the year’s target of 145 lakh tonnes. Sources pointed out that the state government was banking on the monsoon crop t because farmers have not been getting good price for the winter crop in the last few years and have been losing interest in winter cultivation. A senior official pointed out that despite the winter crop’s target being around 15 lakh tonnes, the state has failed to reach it for the last three years. According to officials, the shortfall has also been due to increasing price of fertilisers and diesel, which are crucial to farmers, particularly during the winter cultivation. “During the June-August harvest, diesel is not that important because fields get automatically irrigated by rains. For the winter crop, diesel is an integral element but the price is becoming prohibitive,” a senior official said. Chandigarh, Oct 2: Mandis in Haryana saw the arrival of 75,971 tonnes of paddy on the first day of procurement of paddy during current season. Last year 19,835 tonnes of paddy had arrived on the first day of procurement. A spokesman of the Food and Supplies Department said here on Wednesday that out of the total arrival of the crop yesterday, 74,014 tonnes has been purchased by the government agencies and the rest 1,957 tonnes of paddy has been purchased by the millers. Out of the total paddy purchased by the government agencies, Food and Supplies Department has purchased 31,912 tonnes of paddy, HAFED 20,064 tonnes, Agro Industries Corporation 11,192 tonnes, Haryana Warehousing Corporation 3,627 tonnes and CONFED had purchased 7219 tonnes, he added. He said district Kurukshetra was leading in paddy arrival, where 45,309 tonnes of the crop had arrived in the mandis, followed by Karnal with 15,797 tonnes. District Ambala ranked third, where 13,120 tonnes of paddy had arrived in the mandis, whereas in district Kaithal 965 tonnes had arrived. In spite of crop damage due to floods in parts of West Bengal, paddy production is likely to be higher than usual this year. Factors like use of high-yielding seeds and a good rainfall are expected to boost rice productivity this year, according to experts. "Initial estimates show this year paddy productivity is much more than usual. While it is early to predict actual production, rice production this year is likely to higher than what it was last year," said Pranab Chatterjee, professor at Bidhan Chandra Krishi Viswavidyalaya (BCKV). "This year, new seed varieties and better pesticide and insecticide management contributed to good growth of crop," said Ramaprasad Biswas, a farmer in Nadia. This year, the state government has set the target of increasing rice productivity by 500 kg per hectare, on account new varieties of seeds introduced as part of second green revolution in the east, said Chatterjee. The average rice productivity in West Bengal is close to 2500 kg per hectare. In July-August, floods in nine out of 19 districts, including high rice productivity districts of Burdwan, Hooghly, Birbhum and Nadia, in West Bengal had destroyed a part of standing paddy crop. Paddy production in West Bengal takes place in three seasons - aus, aman and boro, of which the kharif paddy (aus and aman) output accounts for about 70 per cent of paddy production in the state. Last year, in spite of a delayed monsoon, the price of paddy crashed due to excess, but low quality production. The crash was on account of higher production in the boro season, which discouraged the farmers to sow paddy seeds during kharif season.West Bengal contributes 14-16 per cent of India's rice production. The price of paddy in the domestic market had crashed to as low as Rs 850-900 per quintal, against the minimum support price of Rs 1,080 per quintal, due to import of rice from Jharkhand and Orissa.The state government had procured about 3.04 million tonnes of paddy during 2011-12. Till May this year, the state had procured 2.71 million tones of paddy was procured up to May 2013..Rice is cultivated in 18 districts of West Bengal. Out of which 4 districts are under high productivity group, 9 districts are under medium productivity group, 3 districts are under medium-low productivity group and 2 districts are under low productivity group. The Department of Agriculture has set a target to raise paddy crop in 6,000 hectare in Karaikal this season, 1,250 hectares more than last year’s cultivated area. The steady release of Cauvery water to Karaikal region is the main reason for the officials to increase the cultivable area. A. Ramamurthy, Director, Department of Agriculture, told The Hindu that though the cultivable area of paddy had reduced in Karaikal for various reasons in the recent past, it was decided to bring at least 6,000 hectares under cultivation this year as prevailing conditions were conducive. Officials have been instructed to surpass the target, and explore the potential to expand, he said. Puducherry is supposed to get 6.34 tmcft from the Cauvery basin as per the tribunal order. It has hardly received its share in the recent past. However, he hoped that it would get its share of water this year primarily due to an active monsoon. According to information reaching him, Mr. Ramamurthy said water had been released into Noolaru, Nedunkadu, Pandaravaikal, Arasalaru and others from the upper channels of the Cauvery in Tamil Nadu. Senior officials of Public Works Department of Puducherry and Tamil Nadu had met recently to coordinate the sharing of water. He said 40 tonnes of certified seed has had been kept in different societies and agricultural centres in Karaikal for sale. The paddy production in Chhattisgarh in the kharif season 2012 recorded a new height. But the state government officials are in a fix. For, the bumper paddy production in the Chhattisgarh had confused them to fix the target for the kharif season 2013. The department of agriculture prepared the report with productivity target for the year. But it had to put the report on hold when the final figure of paddy production for 2012-13 was released. Known as rice-bowl of the country, the paddy production in Chhattisgarh touched the figure of 11.7 million tonne (MT). The state government had set the target to produce 9 MT of paddy last year. The final result was however surprisingly for them with about 25 per cent higher production. The agriculture department had predicted a productivity of 1,750 kilogram of paddy per hectare for the kharif season 2012. The yield exceeded the target and the state produced on average 2,050 kilogram of paddy in a hectare of land. The end result was 300 kilogram higher than the target. "We had set the productivity target of 2000 kilogram for the kharif 2013 initially but now had to revise the figure," Chhattisgarh's agriculture minister Chandrashekhar Sahu told Business Standard. There was a bid of confusion as to what target should be set but it would be anyway more than last year's target, he added. The officials and agriculture scientists first thought of increasing the productivity target to 2,200-2,300 kilogram per hectare for kharif season 2013 keeping in view the productivity of 2050 kilogram per hectare achieved in kharif 2013. They however dropped the proposal and decided to keep it to 2,000 kilograms, which is more than last year's target of 1,750 kilogram per hectare. "The agriculture condition in the kharif season 2013 could not be the same and hence it would not be fair to fix higher target based on this year's production," the minister said. Hence the state government maintained restrains while setting the agriculture production target for this year, he added. Even experts feel that the productivity for future cannot be predicted. "Especially when the irrigation potential in the state is hardly 30 to 40 per cent," said Sanket Thakur, agriculture scientist. The buoyant monsoon that the state received last year had resulted in bumper production of paddy in Chhattisgarh. The state produced 6.7 MT of rice as against the target of 6.5 MT. That resulted in the heavy inflow of paddy in the procurement centres set by the state government to purchase the yield from the farmers at the minimum support price. Chhattisgarh had created a record by procuring over 7.12 MT of paddy worth Rs 11,000 in the kharif marketing season 2012-13. This was about 1.1 MT higher than last year's figure of paddy procured. The bumper crop had even miscalculated the financial experts of the state planning. As the state would be going to the polls in November this year, the ruling Bharatiya Janata Party (BJP) government had planned to give bonus to the farmers selling paddy at the government-run societies at the minimum support price. The government worked on paying a bonus of Rs 270 for a quintal of paddy assuming that the paddy production would not exceed 6.5 MT. The figure cross 7.1 MT and the state exchequer had to bear an additional burden of Rs 1,900 crore to pay bonus to the farmers. THIRUVANANTHAPURAM: The state government has been trying hard to push the declining paddy cultivation by allocating huge funds and proposing innovative projects in the last two budgets, but these initiatives have not made much of a positive change in the sector. The latest land use pattern released by the planning board show that the net sown area in the state declined by 1.5% in the past two years. The rice cultivated area decreased by 5,027 hectares in these years while there has been an increase of 5,727 hectares in the area of fallow land. Of the total geographical area of 38.86 lakh hectares, the net sown area now stands at 53% while the total food grain production reached 0.6 lakh tonnes last year. Essential food crops like rice, pulses and tapioca occupy just 10.8% of the total gross cropped area of 26.6 lakh hectares. 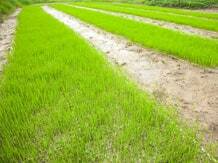 "It is a matter of concern that the area of paddy fields is decreasing year after year. The paddy fields, in the low lands, have a greater environmental role to play in conserving water and rejuvenating ground water resources. The increase in fallow land would invariably increase the possibility of reclamation of paddy fields in the coming years," warns environmentalist M K Prasad. He says many projects like rice bio parks still remain on paper as officials are not pushing for the implementation of the project in an effective manner. "The state should take a few lessons from Tamil Nadu, which is doing a marvellous job in running effective rice-parks," he says. Finance minister K M Mani has, in this year's budget, made a huge allocation for agriculture sector and set aside Rs 200 crore for various projects. Last year, Mani had introduced concepts like rice-parks and high tech agriculture to increase productivity. "The main advantages of high-tech farming are capacity to overcome climate change, increased productivity and improved quality. We have also introduced concepts like high-tech farming and micro irrigation, capable of controlled and effective utilization of water, green house farming techniques with minimal dependency on soil and usage of advanced hybrid seeds," a senior official said. On the positive side, the production of rice has increased by 281 kg/hectare in the past two years. "This is due to better usage of mechanised technology. But more needs to be done to encourage farmers to sow paddy and not let the paddy fields become just fallow lands," said a senior official with agriculture department. "Kerala is facing a serious challenge in maintaining the meagre agriculture area. The state's agriculture economy is undergoing structural transformation from mid-seventies and over a large proportion of its traditional crop area which was devoted to subsistence crops like rice and tapioca to more remunerative crops like banana and plantation crops," the state planning board had said.